To work as a waitress in a hotel, one should have professional skills and patience. To develop business the service should be outstanding so that the customers are attracted more to visit the hotel. The interviewers check the candidate’s attitude and ability to work before qualifying them. The candidates should be well prepared and it is not possible to guess what questions will be asked but should be able to answer instantly with the presence of mind and knowledge. One should push themselves to stand out as best among the crowd. Here are few commonly asked waitress interview questions and answers. 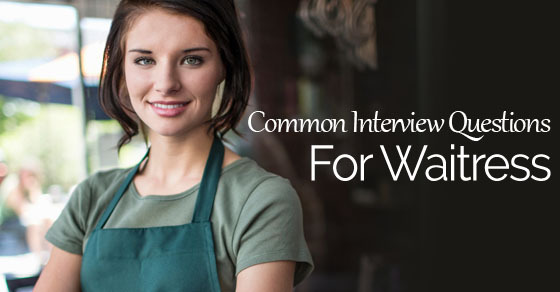 Interviewing for a waitress interview is similar to that of an regular interview. The primary difference is that, waitress interview would look more like a audition where the candidate need to show his cooking and serving style. Earnings from the waitress will be good. So, getting a job in a bar or restaurant as a waitress might not be a cake walk for you as there will be a lot of competition. When you are attending a waitresss interview your attire plays a key role. No matter what kind of interview you are attending, never enter the interview room without proper outfit. Ensure you dress in a professionlaly way before attending an interview. Right outfits will give you enough confidence and leave a good impression about you to the interviewer. Here is a list of interview questions for waitress which can provide the overall picture of such interview selection process. Tell me something about yourself, this is the basic question that will be asked by the interviewer. Always remember to say about the strengths and positive things about you in the interview. To be a unique applicant in the interview, one should not boast about themselves but should elevate their attitude and zeal to work in this role. Try to relate your previous experience with the waitress role how that experience will help to grab this position. Let them know your ability with an example how did you manage a tough customer with your patience and pleasing smile. 2. What do you know about waitress role? The waitress had to take orders from the guests and serve them with their desired menu. As soon as the guest appears you have to greet them and provide them with menu card. Once they have decided to order, note the order and provide the same order to kitchen staff so that they prepare the food and can be served with the help of a boy. 3. What brings you to work in this role? Show them that, are you feeling excited to work in their prestigious hotel. Study about the organization before attending the interview so that you can showcase how enthusiastic you are towards the job. 4. What is the best part as a waitress? One can prove as a unique candidate by answering this question. Like, it is not routine job, it will give the opportunity to meet different kind of people. One should be able to convince and satisfy the customer with their service. It gives chance to prove, interpersonal skills. Every customer is different so have to deal with each one according to their behavior. It gives a lot of satisfaction by serving and getting feedback from the customers. It is a chance to present yourself and gives chance to develop in career. 5. What is the toughest time you faced in your life? Like for example, one day you had to handle many customers, which is very important for the hotel to make business on that day, tell them how quickly you took a menu and served the customers well with the help of your team. One will not appoint only for a specific role, they promote you for different roles where you need to work with a team, in that case how do you manage, this is what exactly the interview checks keenly while doing interview. Tell them how can you integrate yourself in the team and work for the organization. Tell them how fun it is to work with team and enjoy the workplace environment. 7. How would you help in the success of a restaurant? One should not only look into individual goals, but also should work for organization growth. You can answer by saying that one should able to manage the customers with a great respect and should never be rude to customers. Apart from the food taste the service also should be extraordinary. If their experience is good, they would visit again and again, which will be plus point of the restaurant also they may receive party orders because of the fame spread by the customers. We just have to take care that the customers enjoying the food at our restaurant. This is enough to improve the business and this is how I would help in the restaurant success. Never display the interviewer that you handled the customer badly, tell them that you tried to help them but still the customer is not satisfied. Example: Once I got a chance to face the couple who were in an argument and they are in a bad mood. I tried to help them, I gently asked them what they would like to have. They were very impatient at me, but still I maintained my pleasant smile and took the menu as per their instructions, when people are at bad mood they will not like whatever we do so all one need to do is just understand their mood and carry out the same professional behavior. 9. Are you ready to stretch yourself for extra hours? “Yes I am ready to serve the organization whenever they need my help. Sometimes the restaurant may be houseful with crowd and short of staff. Then I will be always there to work hard for the success of the restaurant. This question is to know whether the candidate is able to handle the pressure and ready to help restaurant in hard situations. It is to know how stable the candidate is in doing the work. 10. What’s more, that the waitress has to do? It is not enough to just take the order and provide them a bill. I will also check whether the table arrangement is good and comfortable for the customer. Have to check whether the glasses and other spoons, forks, knives are available. Also check whether the water is refilled in the middle of the meal. Find whether the food is good, or if there are any issues try to solve them, replace the food if something went wrong. Help the customers if they want anything else from a meal like desserts, etc. When they are done with the meal I will wish them that it is happy to serve them and hope to see them again. 11. What do you want to work for our restaurant? This question actually will be helpful for the candidate, this is a chance to impress the employer. It will be an addition if you had experience in having some food at their restaurant so that you can share your good experience how you enjoyed it. 12. How would you take negative feedback? 13. What have you learnt from your previous job? Most probably the employer might try to get some negative opinion from a candidate about his / her previous job experience. But the way of handling such question would be that when a candidate is approached by such question then he / she needs to project the positive side of his / her previous job. And also have to keep in mind that a candidate needs to present only positive side of the restaurant or company even if they are no longer working in that particular restaurant or company. 14. What are your strengths and weaknesses? Most commonly these strengths and weakness list of questions are asked for the sake of understanding the level of hard work that a candidate can put out . The candidate must keep in mind that while answering such question they need to present a set of strengths and weakness which cannot be questioned in future terms. Sometimes the employers confuse the candidate by tricking them inside the answers they have already given. 15. What are your additional skills? In this fast and competitive world, the employer expects an additional skill that can be enclosed for the purpose of successful turnover of the restaurant business. And that’s why the candidate should have some special skills like bar attending or anything, this provides a possibility that the candidate might get selected for the waitress job offered. Therefore, obtaining additional skills in a restaurant business can be an added advantage for the candidate. Working in a restaurant and being a waitress is something related to their communication skills which helps them attract customers to their restaurant with their service. Therefore, it is necessary that while selecting a candidate for the waitress position the employer need to be well aware of his/her communication skills. Excellent communication skill can provide the candidate the waitress job which can eventually benefit the restaurant business. There are some situations in the restaurants when a waitress need to handle more than work under certain situations. For that purpose the employer needs to hire such candidates in the restaurant who can handle more than one work when there is a crisis situation. Obtaining the qualities of a Multitasker can bring a candidate the position of waitress as it is required in the job description. Therefore, while answering such question the candidate needs to keep in mind that if they really need that job, then they are supposed to be Multi Tasker. 1: What is your biggest strength? 3: Tell me something about your work experience ? 4: What is the best part about being a waitress? 5: What do you think is the least thing about being a waitress? 6: Can you prepare tables? 7: Can you use a coffee machine? 9: Do you have knowledge on wines? 10: Do you have bar experience? 11: Resaon to work at this restaurant? 12: Tell me why we should hire you? 13: Have you got experience making and/or serving desserts? 14: Do you have experience carrying serving plates? 15: Explain how will you deal with an angry customer? 16: Have you ever worked for long shifts before? 17: Are you comfortable working for long shifts? 18: How do use your free time? 19: What expectations and responsibilities do you have from this job? 20: As a waitress, what would you do to keep yourself, and your colleagues, safe at work in terms of health and hygiene? So these are common waitress job interview questions and answers. This waitress tips may help to get selected in the interview. Along with these questions one should be ready to face spontaneous questions by the employer. All these above mentioned waitress interview questions and answers may help candidates who are willing to go for a restaurant waitress job and definitely these information will help them to get employed.